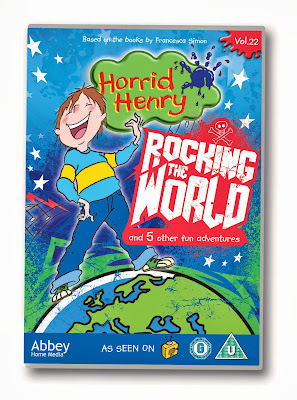 Our latest DVD review from Abbey Home Media is Horrid Henry Volume 22: Rocking The World. 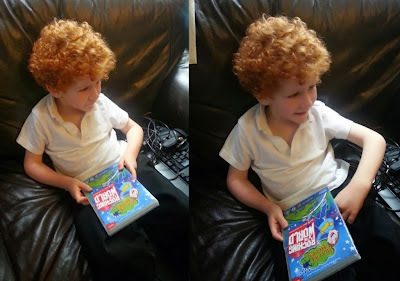 I know that sometimes, especially for people with younger children, opinion is divided about Horrid Henry, but I don't find him particularly horrid at all. All of my children are very capable of being far more horrid without any prompting. Henry is really rather more of a leader, the brains behind the pack, and every tale has a subtle (or not so subtle) message. Henry has to deal with that most awful of things - his family - including the detestable Perfect Peter, his brother. It's tricky having a brother like that, it's a lot to be compared to and the pressure is hard on Henry. I'm sure a lot of young people can identify very much with that situation - even if it is exaggerated for comic effect. I personally identify with his long-suffering parents. I think I probably have the same exasperated expression most of the time! Henry has a long list of things he doesn't like beyond his relatives - including homework, fresh air, boring holidays and bedtime, and most of his class. Most of Henry's enemies are in his school class, and a lot of the story episodes revolve around their interaction. My 3 and 5 year old boys like Horrid Henry, and they were glued to the screen watching this. It also proved popular with my older children, especially our 15 year old girl, who loves Horrid Henry and was delighted that we all sat down and watched it while we ate a takeaway. I find the voices a bit grating, possibly because they remind me of our lot when they're at their worst, but it's still entertaining for adults and has some very funny moments. It's ideal for children and young people of any age, and has a Universal rating. Released on September 23rd 2013, Horrid Henry: Rocking The World will have an RRP of only £7 and is available at all good stockists. win one of 3 copies for yourself here. This sounds great. I do like to find something we can all sit and watch together! Not seen Horrid Henry yet but he can't be as bad as Monkey in the afternoon these days! Z loves Horrid Henry. He's been reading the books at the moment.